WHY CHOOSE A WATER EXTINGUISHER? WE HAVE YOUR ANSWER. These Fire Extinguishers can be identified by its color labeling…which is solid red. 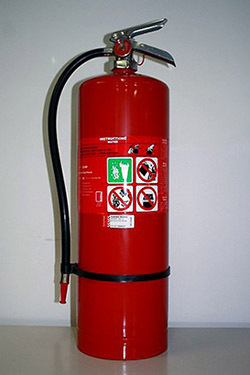 Recommended for Class ‘A’ fires (wood, paper, plastics, textiles, rubber) , this fire extinguisher is available in the most common 9 litre capacity. Acting to reduce temperature of the burning fuel, this extinguisher is used to disperse fires involving wood, paper, plastics, textiles, rubber and rubbish. Once the burning fuel has been reduced to below ignition temperature, the fire can be brought under control. It is most important to remember that this type of extinguisher is NOT suitable for classes ‘B’, ‘E’ or ‘F’ where flammable and combustible, electrically energized equipment and cooking oil and fats is involved. Available in 9.0 litre size. Again it is recommended that the extinguisher you buy is approved by Standards Australia. WHY BUY YOUR WATER FIRE EXTINGUISHER FROM LONDON FIRE & SAFE?